International law, anchored in the Charter of the United Nations , is the very foundation of the Organization. Promoting development and respect for international obligations has always been a core aspect of United Nations activities. 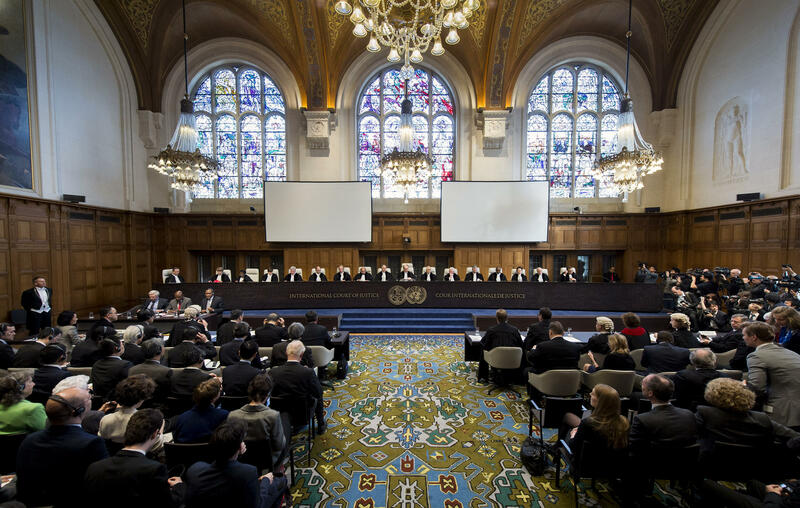 Efforts in this sphere include encouraging the progressive development of international law and its codification, support to the growing network of international treaties , and international dispute resolution mechanisms. These efforts are based on the core values and principles of the United Nations, and contribute significantly to the collective international effort to maintain international peace and security, promote human rights and foster sustainable development. Conflict and post-conflict situations require the progressive restoration of the rule of law. The United Nations supports these situations through different forms of humanitarian assistance . Justice, including transitional justice , is a fundamental building block of sustainable peace in countries in conflict and post-conflict situations. The United Nations assists and supports countries in addressing serious violations of human rights and providing redress to victims upon their request. The backbone of the freedom to live in dignity is the international human rights framework , together with international humanitarian law, international criminal law and international refugee law . Those foundational parts of the normative framework are complementary bodies of law that share a common goal: the protection of the lives, health and dignity of persons. Fair, stable and predictable legal frameworks are also important for generating inclusive, sustainable and equitable development, economic growth and employment, generating investment and facilitating entrepreneurship, and in modernizing and harmonizing international trade law.